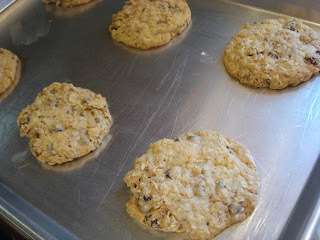 I don't know what's going on with me and oatmeal cookies lately but I seem to have a need to try out different recipes! There were these...then these...then I took a break and now these! I have to say these thin oatmeal cookies are just the best. They're crunchy on the edges and chewy in the middle and they have just the right amount of sweetness. The original recipe called for dates but I loved the idea of using currants. Because the cookies are thin, I think the small size of the currants is perfect. Raisins would be too big and clunky! And because they're thin...oh the possibilities! 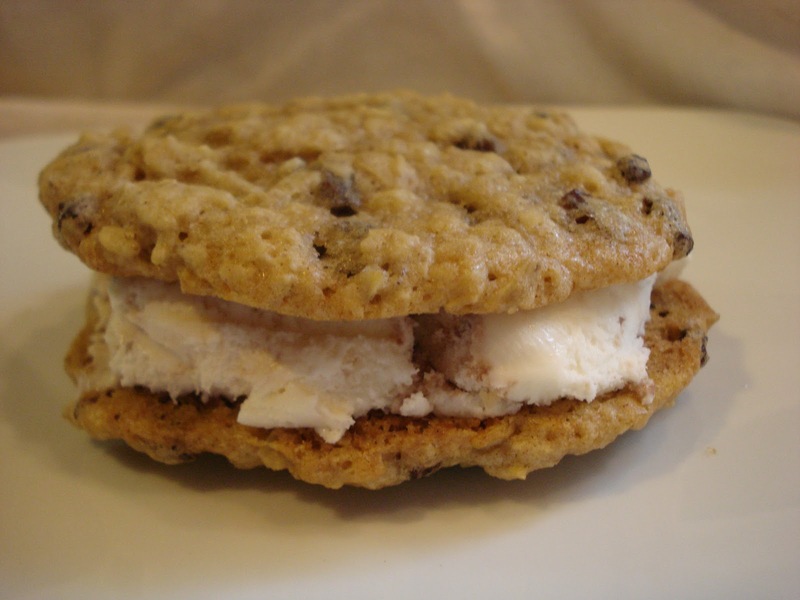 Ice cream sandwich cookies, or how about oatmeal cream pie cookies? But even plain they're great. 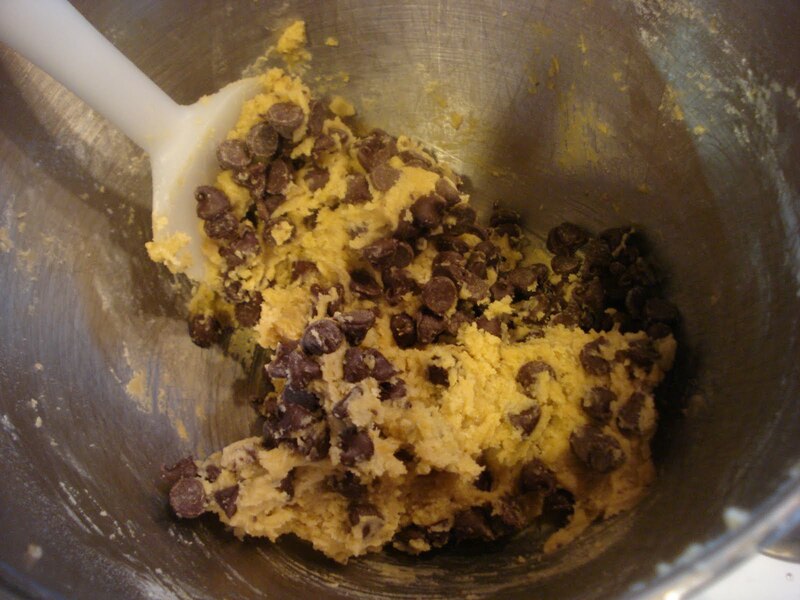 Begin by combining the dry ingredients. Then cream the butter one minute. Add in the sugars and cream 3 minutes. And stir into the creamed mixture. 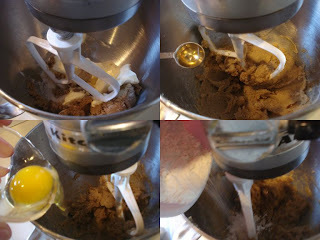 Once that's all mixed together, scoop the dough onto your parchment lined baking sheet and flatten each cookie with either the back of a wet spoon or your wet fingers (my choice). Bake for between 11 and 13 minutes. Mine took about 13 minutes but you want them to be browned along the edges but still a little moist in the centers. 1. In a medium bowl, whisk together flour, salt, baking soda, cinnamon and nutmeg. 2. Add the currants ( or chopped dates, breaking up the clumps) and oats. Set aside. 3. 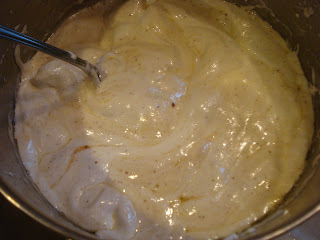 Cream butter one minute, then add in the sugars and cream 3 minutes. 4. 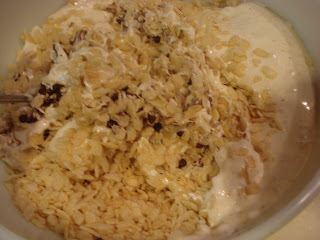 Add in the eggs and vanilla and cream 2 minutes. 5. Add in the dry mixture and stir til well combined. 6. Scoop dough, about 1 1/2" size balls, onto baking sheet spacing about 2" apart. Flatten each ball with either the back of a wet spoon or your wet fingers ( my choice). 7. Bake for between 11 and 13 minutes, depending on your oven. You want the edges to be browned and the centers to be still a little moist. 8. Cool on the sheet for 2 to 3 minutes, then transfer to a wire rack to cool completely. 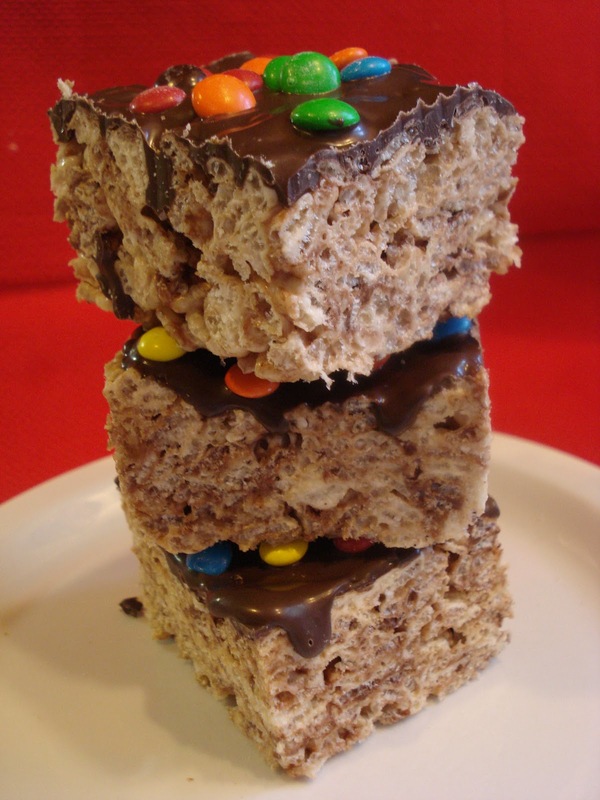 Malted milk has come a long way since being first introduced as a nutritional supplement for infants! 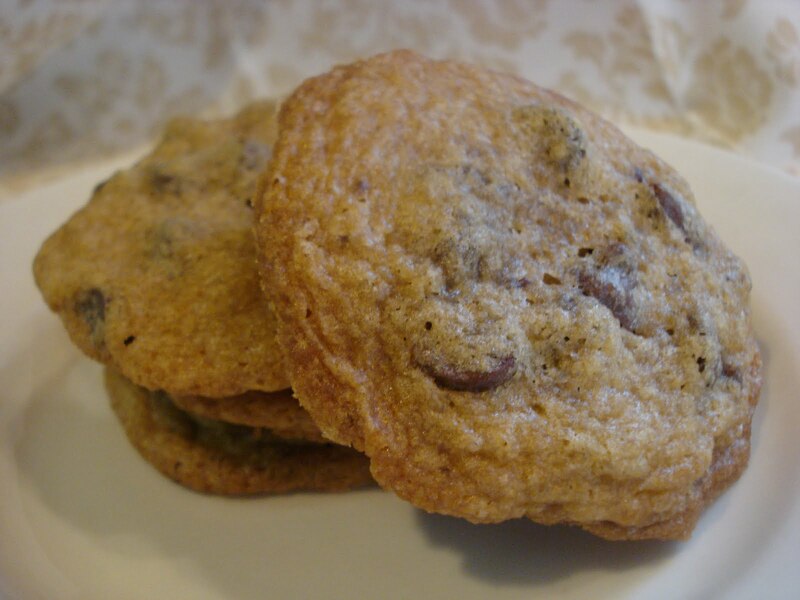 These cookies are from a cookie contest in 2002 called "The Great American Cookie Contest". The recipe was a finalist in the contest and when I came upon it I felt it would be a good one to experiment with using malted milk powder. The other ingredient in this recipe, which I think, is a bit different, is a little sweetened condensed milk. 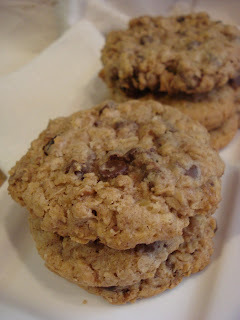 The cookie ends up tasting a bit on the mild and creamy side. There's more white sugar to brown sugar so it doesn't have that nice caramel flavor but it's delicious, just the same. And what do I do with the rest of that sweetened condensed milk? I think there's a Key Lime Pie in my future! 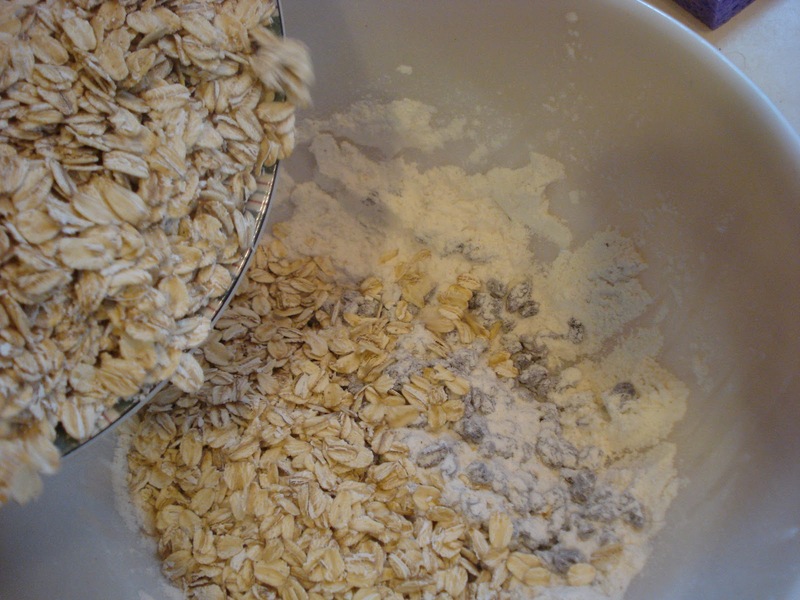 ﻿First combine your dry ingredients together in a medium bowl. 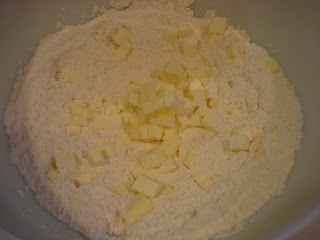 Then in a mixing bowl, cream the butter and sugars. And the sweetened condensed milk. 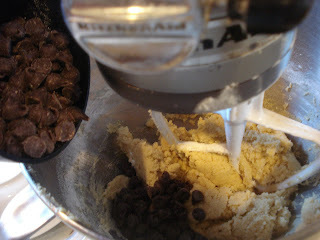 Stir in the dry ingredients, then stir the chocolate chips in til just incorporated. 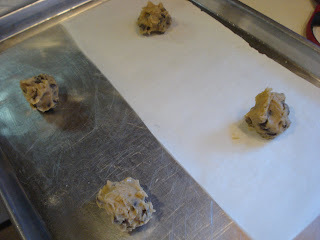 Form the dough into 1 1/4" balls and place on an ungreased cookie sheet 2' apart. Bake 10 to 12 minutes or til the edges begin to brown. 1. 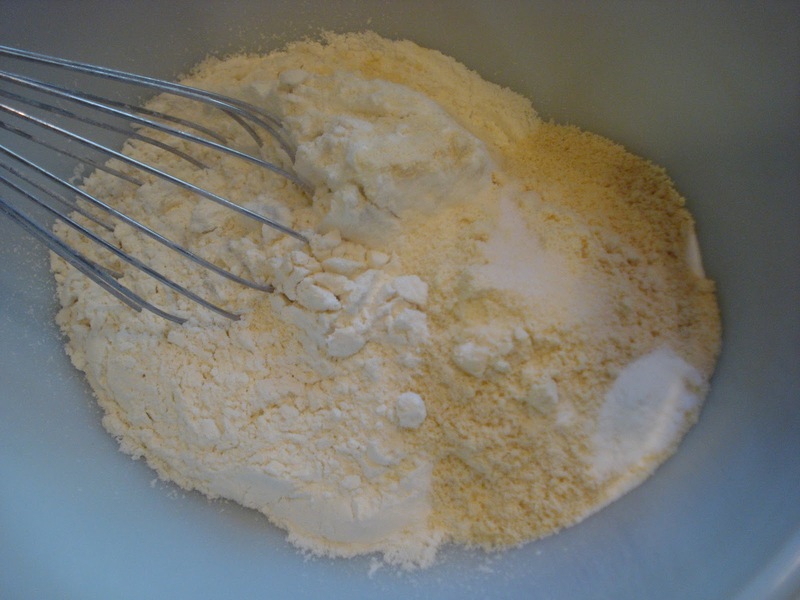 In a medium bowl, combine flour, malted milk powder, baking soda and salt. 2. 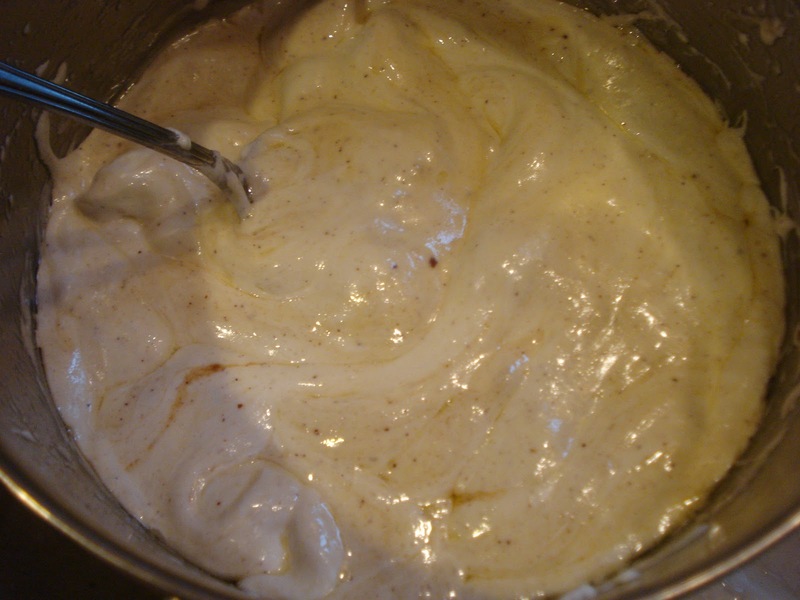 Cream butter and sugars in a mixing bowl on medium speed til light and fluffy, about 3 minutes. 3. Add the eggs, vanilla and sweetened condensed milk and beat on medium speed til light and fluffy. 4. 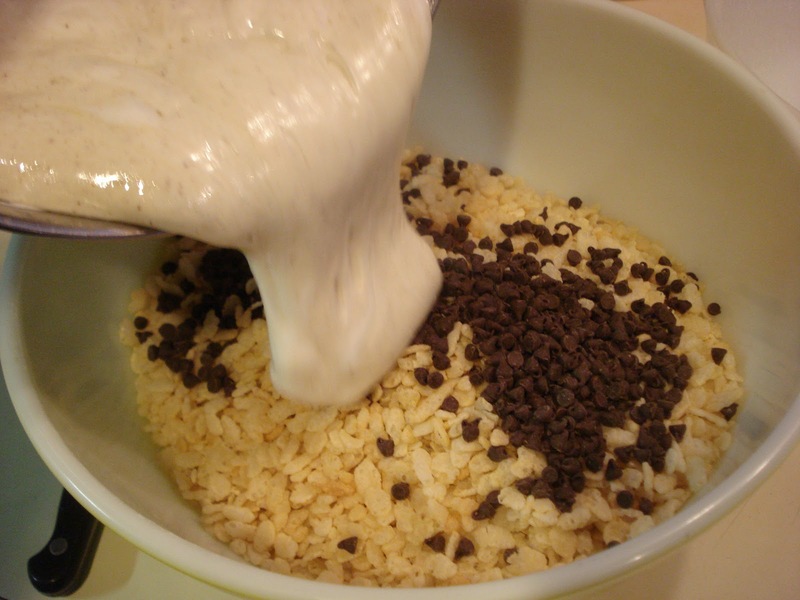 Stir in the dry ingredients, then the chocolate chips til just incorporated. Don't overmix. 5. 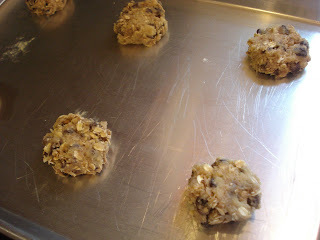 Form the dough into 1 1/4" balls and place on the baking sheet, 2" apart. 6. Bake for 10 to 12 minutes, or til the edges are slightly browned. ( Mine took a full 12 minutes). This post is a bit overdue...sorry! I participated in an Outdoor Expo Saturday with over 8,000 people in attandance and, needless to say, I needed to focus on making, freezing and finally baking tons of cookies! But it was a great day and I sold out of all my cookies...so it was definitely worthwhile. Rice Krispie Treats are just one of those perfect treats to make for a crowd...quick, easy and kids and adults just love them! This recipe is adapted from here but I added mini chocolate chips to some of them, M&M's to some others and even peanut butter chips to others. The kids gravitated to the M&M's on top ( not a surprise!). The browned butter gives them a more buttery, almost nutty flavor...really good! You can really add just about anything you can think of that would make an interesting addition. How about crushed cookies, like Oreos...or the M&M's mixed in? And I made mine a little thinner because I used a 7" x 11" pan rather than an 8" pan. Be sure to have all your ingredients ready before you begin. Notice I cut the large marshmallows in half to get them to melt quicker...using mini marshmallows is best and that's what I bought for the next batches I made. In a large pan begin melting the butter over medium high heat. Keep an eye on it and stir gently as it begins to brown. It will foam up by as you stir you'll notice browned bits falling to the bottom of the pan. Once this happens, take the pan off the heat. 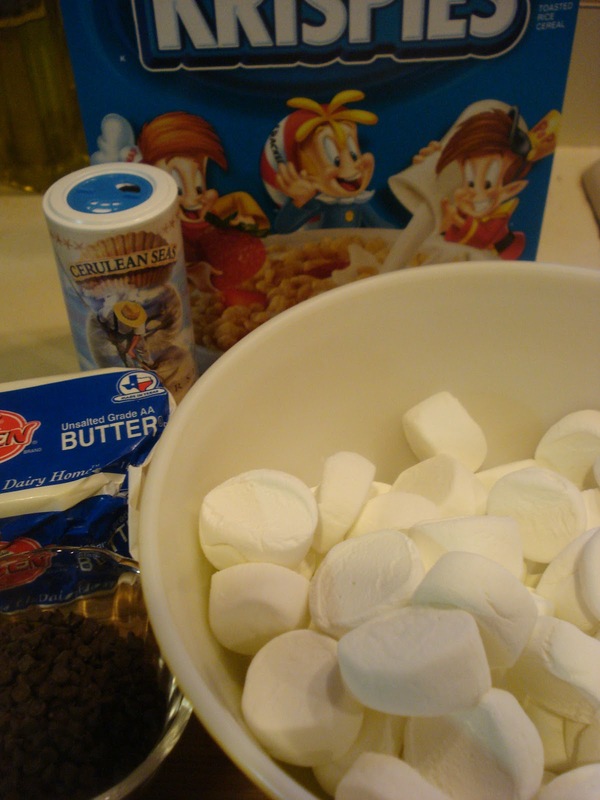 Add in the marshmallows and stir them til they all melt. I found I had to put the pan back over low heat to get them to melt totally. The mixture should look nice and smooth. And stir quickly to mix it all together. 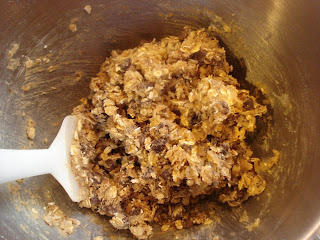 Then scrape the mixture into your prepared pan and press down to get it even and in all the corners. Once it's cooled you can melt the chocolate and spread over the top and sprinkle with whatever toppings you'd like, then let it cool to set the chocolate. Approx. 1 - 1 1/2 cups dark or semisweet chocolate chips or melting discs, ( optional )mixed with about a teaspoon shortening. Butter a 7" x 11" or 8" ( for thicker treats) pan and set aside. 1. In a large bowl, combine the cereal, mini chocolate chips and salt. Set aside. 2. 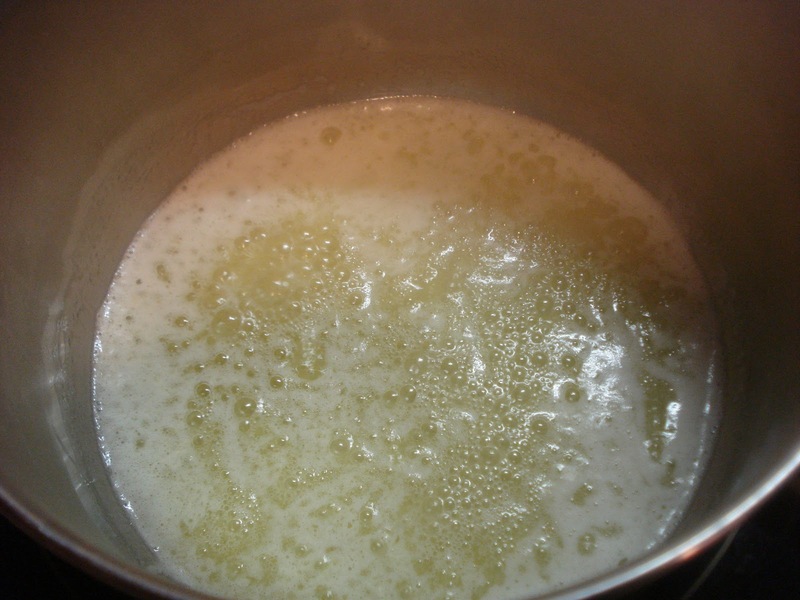 In a large pot, melt the butter over mdeium high heat, then let it begin to foam, keeping an eye on it as it continues to bubble and foam. It will quickly change as it darkens and begins to smell nutty. Take it off the heat at this point and stir in the marshmallows. 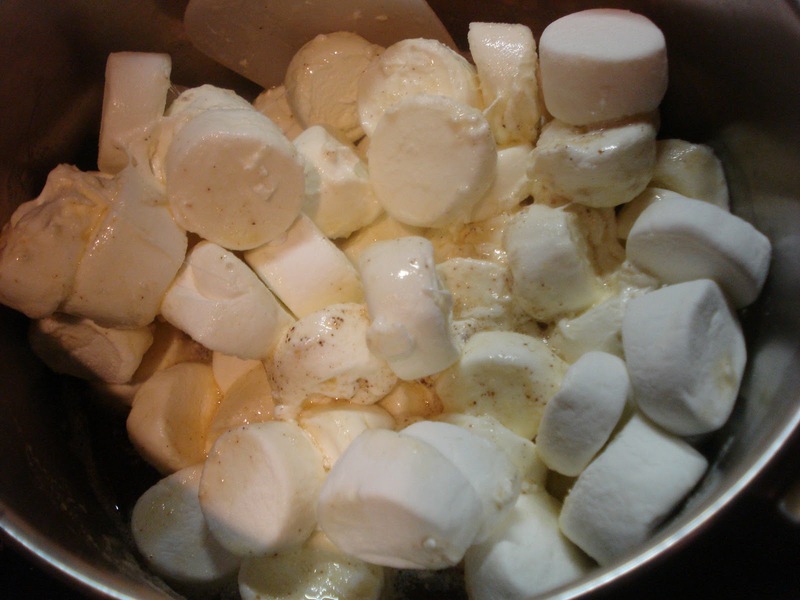 Keep stirring and place the pan back over very low heat if the marshmallows don't melt well, but keep stirring all the while. ( I had to do this). 3. 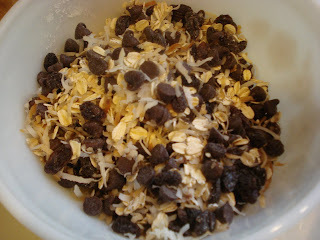 Once the mixture is smooth, add in the mini chips, cereal and salt mixture and stir to completely combine. 4. Pour or scrape the mixture into your prepared pan and press down to make it even, getting in the corners. 5. Let it cool, then if you're coating in chocolate, melt the chocolate over a double boiler over barely simmering water with the shortening, stirring til smooth. 6. 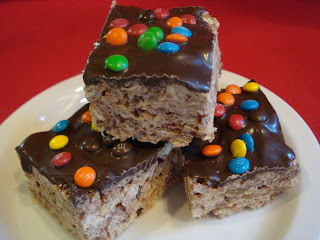 Pour the chocolate mixture evenly over the treats and sprinkle, if using, the topping on while the chocolate is still wet so it sticks. Chill to set, then cut into squares. This weekend I should have stayed out of the kitchen entirely! I made a chocolate cookie bar and a cake that both turned out to be such a disaster that I had to toss them both..such a waste of time and money. I guess I should have known better. Most of my weekend was taken up with painting the ceiling in my back porch. As if that's not chore enough. It's such a lousy job to paint a ceiling! But I wanted to get you at least one new recipe this weekend..oh well. Hey, maybe I could blame it on the moon, right? It hasn't been this close to earth in, what, about twenty years, or something like that. Did you see it? It was spectacular...but I digress. 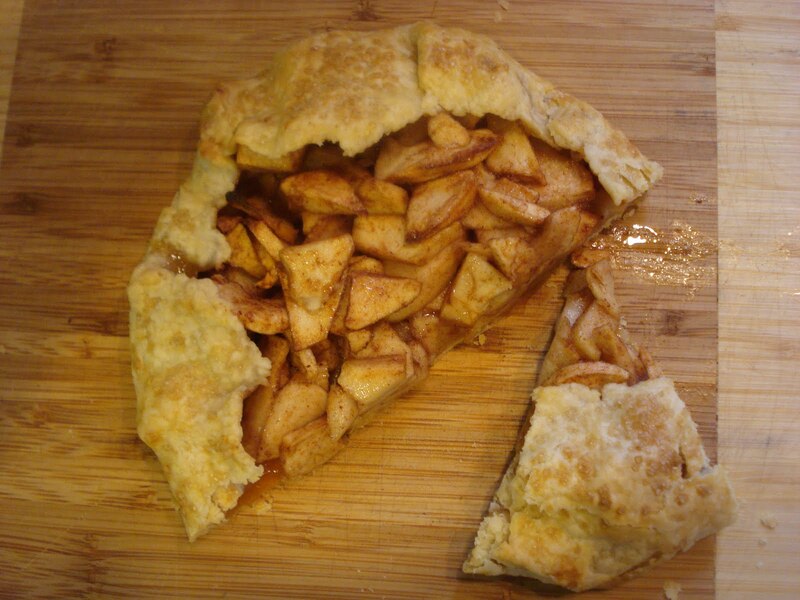 So, needing to make something that was, first, created from what I had in the house this morning and second, something pretty much foolproof, I chose a rustic Apple Galette. Not too difficult to make. 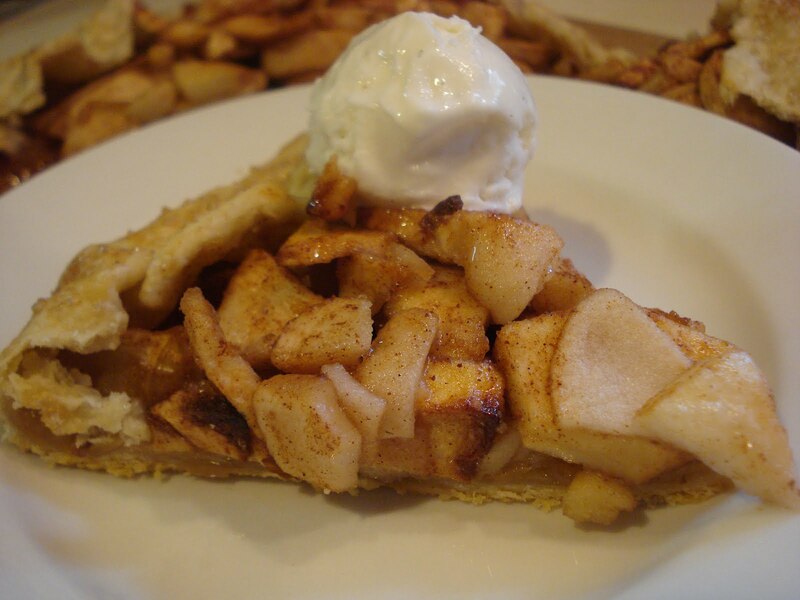 Pie crust, chopped apples, spices...and the best part? It's so good! I created this version from about three different recipes. I took a little from here, a little from here and a little from here. And came up with this rustic and delicious galette. I streamlined some of the steps to make it as quick and easy as I could. This is a perfect galette for a weekday dessert and pretty enough for company! Just add a dollop of whipped cream or vanilla ice cream. First you want to make the crust so it can chill out in the fridge for about 30 minutes. 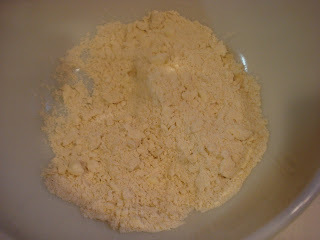 Once the cold butter pieces are added to the flour, just begin working the butter into the flour til you have small pea size pieces. Then begin adding in the ice cold water, a tablespoon at a time, mixing lightly with a fork til it begins to come together. Feel it with your fingers to be sure it has enough water but not too much. Once it comes together, form it into a disc and wrap in plastic and put into the fridge for 30 minutes, at least. While the dough is chilling, make the apple filling by mixing the sliced and chopped apples with cinnamon, nutmeg and sugar. Roll out the dough to about a 1/4" thickness and spread the warmed apricot jam onto the center going only to within about 2" from the edge. Then sprinkle the almonds over the jam. 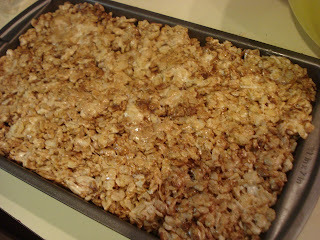 Spread the apple mixture over the almonds, still leaving about 2" aound the edge. 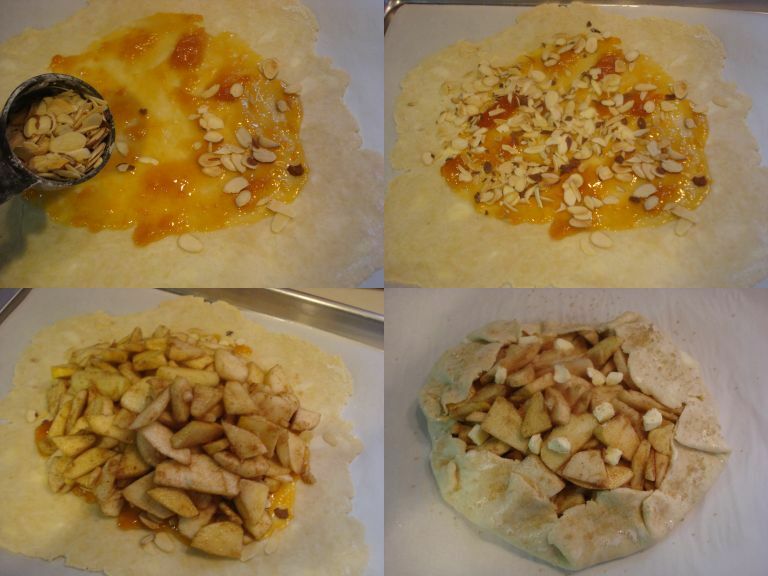 Fold the edges over all around and lightly press the dough into the apples. 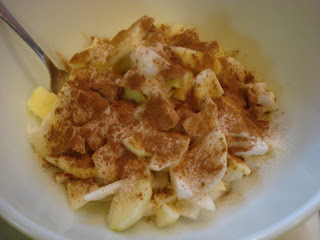 Dot the apples with butter and brush a little milk over the edges and sprinkle with raw sugar. Bake between 50 and 60 minutes. 1. 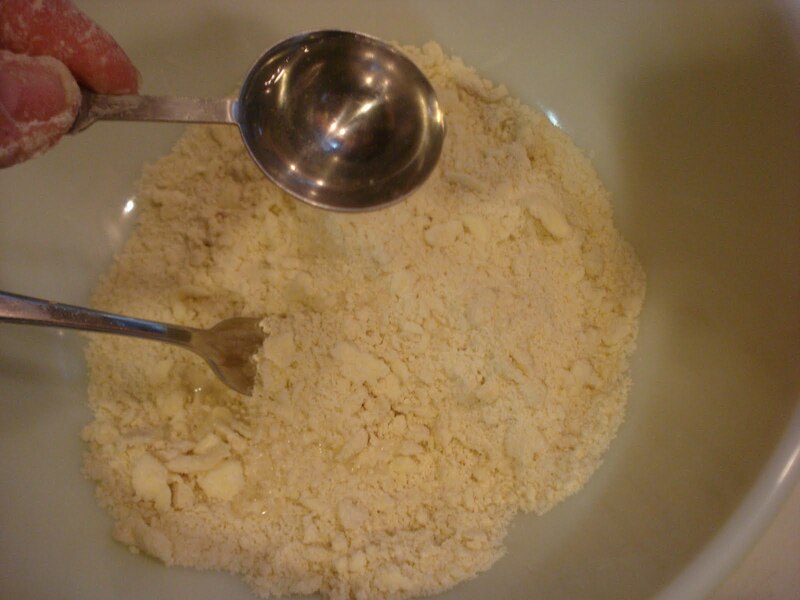 Make crust by combining the flour, sugar and salt in a large bowl. 2. 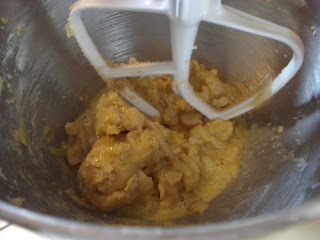 Add in the butter pieces and work the mixture together with your fingers til it resembles pieces the size of small peas. ( Some pieces will be larger than others). 3. Add in the ice water, one tablespoon at a time, mixing lightly with a fork. Feel the dough with your fingers to be sure it's not too dry. Add in just enough water so it forms a ball. You may not need all the water. It depends on the weather and how much humidity there is). 4. Once you form a ball, place the ball of dough onto a piece of plastic wrap and form into a disc shape. Wrap and chill the dough in the fridge for at least 30 minutes. 5. 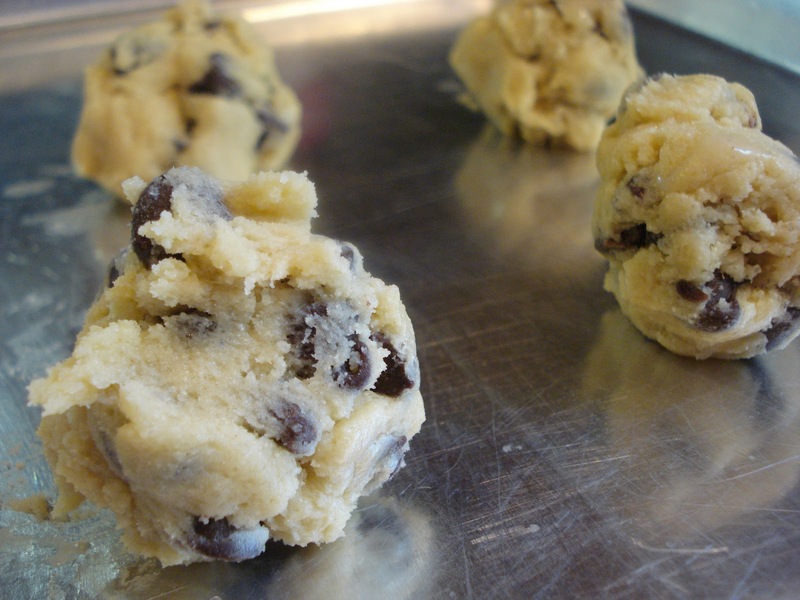 Make the filling while the dough is chilling. Peel, core and slice the apples into thin slices and cut each slice in half. 6. Place the apples in a large bowl and add in the sugar, cinnamon and nutmeg and stir to combine well. 7. Preheat the oven to 400. 8. Warm the apricot jam in a small saucepan just til it begins to melt and become a more spreading consistency. Take off heat and set aside. 9. Roll out the chilled dough between 2 pieces of plastic wrap to about a 1/4' thickness. 10. Place the dough onto a parchment lined baking sheet and spread the apricot jam onto the center, keeping within 2" from the edges. 11. 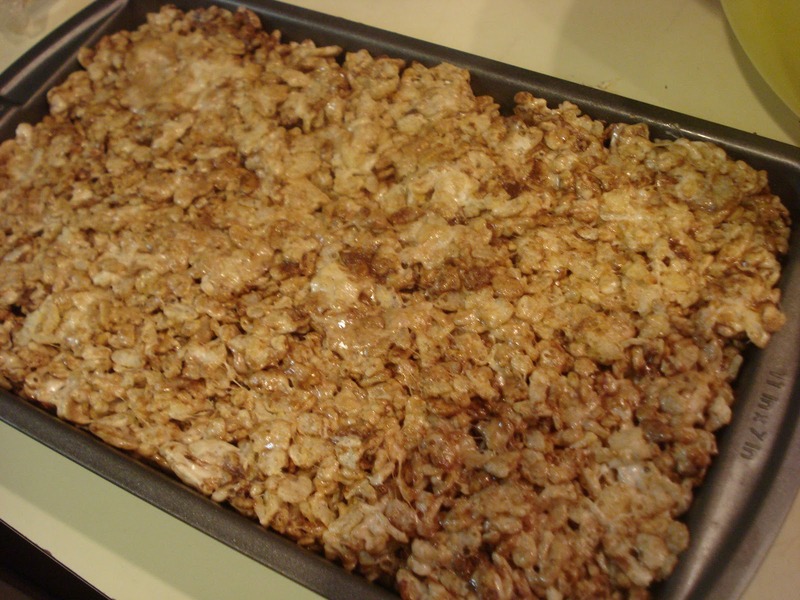 Sprinkle the almonds over the jam, then place the apple mixture on top of the almonds and jam. 12. 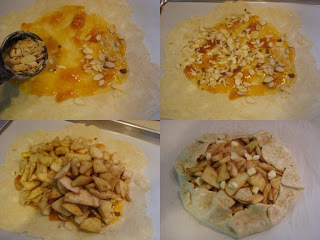 Fold over the dough edges and press into the apples lightly. Brush the edges with a little milk and with sprinkle raw sugar. 13. 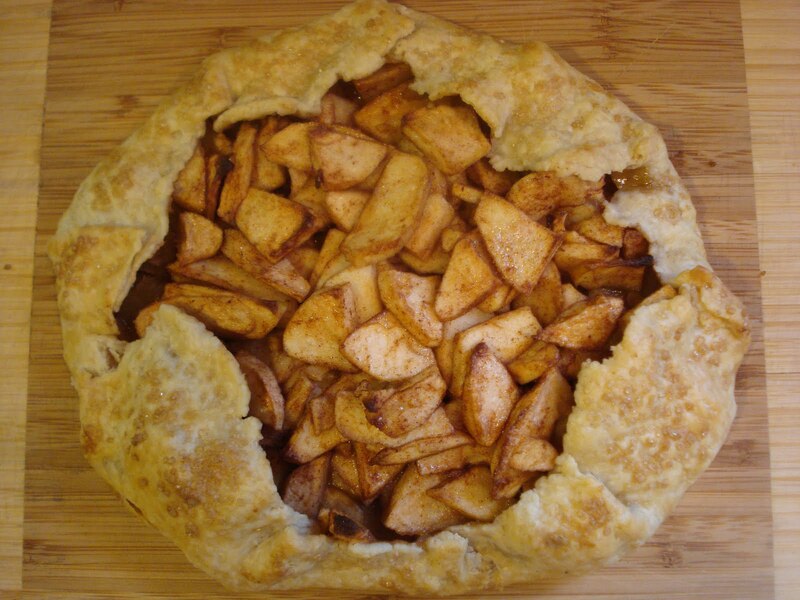 Bake for 50 to 60 minutes, or til the crust is a nice golden color and the apples are soft. 14. 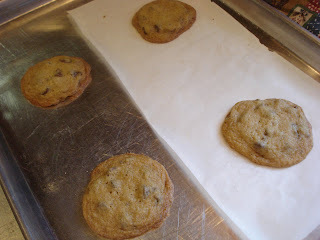 Lift galette off the baking sheet with the parchment paper and cool on a wire rack. The galette is best served warm with some vanilla ice cream or whipped cream. Powdered sagar dusted over the top would also be pretty. Enjoy! I was standing in line at the check out counter today and the newest issue of Family Circle caught my eye. I spotted a beautiful lemon bundt cake on the cover so I grabbed the magazine and proceeded to flip through it and I landed on these cookies. So what could I do? I had to spring for the $1.99 for the magazine and go home and make them! They sounded so good. I do try to fight the temptation to buy, yet another magazine because I have so many now. And I usually get them for about fifty cents at the my local thrift shop ( big spender that I am!) but I gave in...I love cookies with lots of "stuff" in them. And I'm sure I've posted many already...so here's another! You can probably add whatever you like into them. 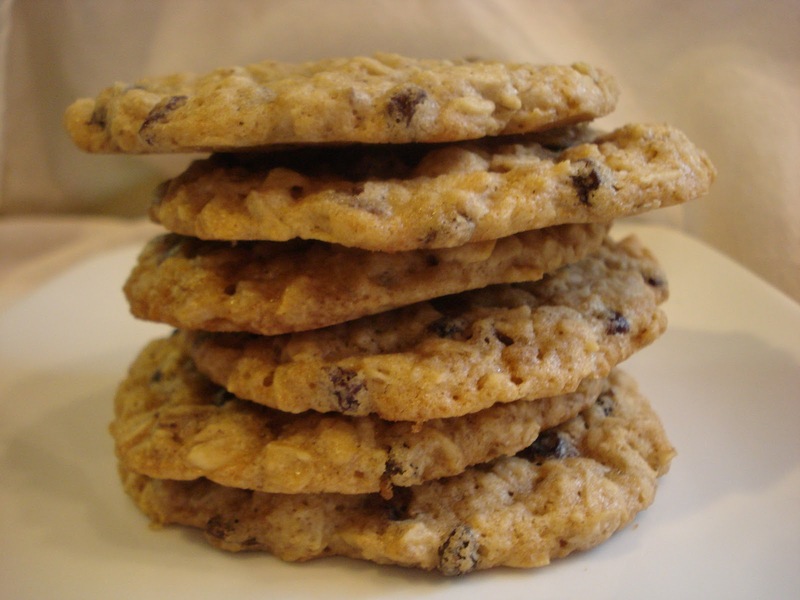 The original recipe calls for coconut, oats, semisweet chocolate chips and mixed jumbo raisins but you could also use dried cherries or cranberries, nuts or even pumpkin seeds, if you like them. They are kitchen sink cookies after all! Let me tell you, these cookies are addictive. 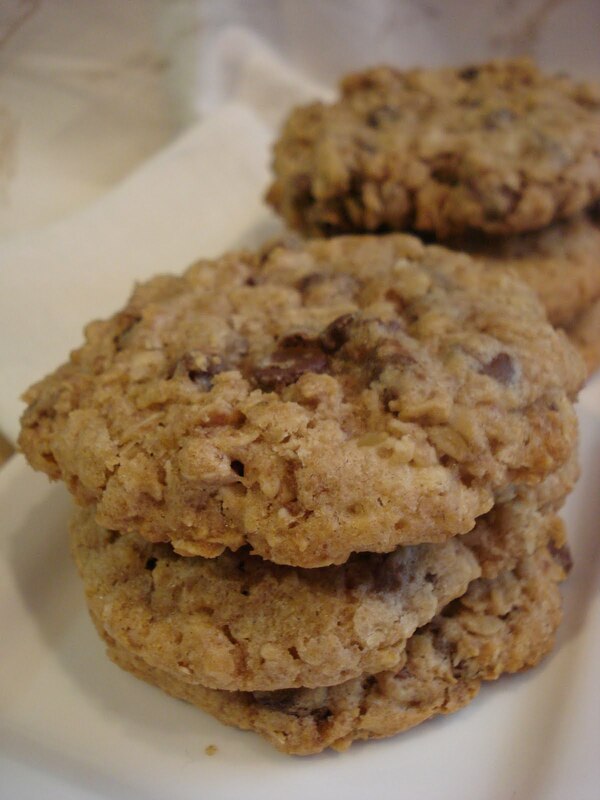 With every bite you get a taste of everything you put in the cookie and they're chewy and crunchy and...so good! Start by whisking the dry ingredients together, then set aside. Combine the add ins in a small bowl and set that aside. 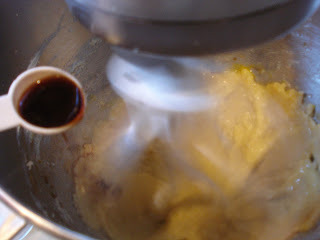 Then do your creaming of the butter with the sugars, then add the eggs and vanilla. Beat in the dry ingredients, then stir in the add ins. Scoop 1/4 cupfuls onto an ungreased baking sheet spacing about 3" apart and flatten them slightly. Bake for about 20 minutes and transfer to a wire rack to cool. 1. 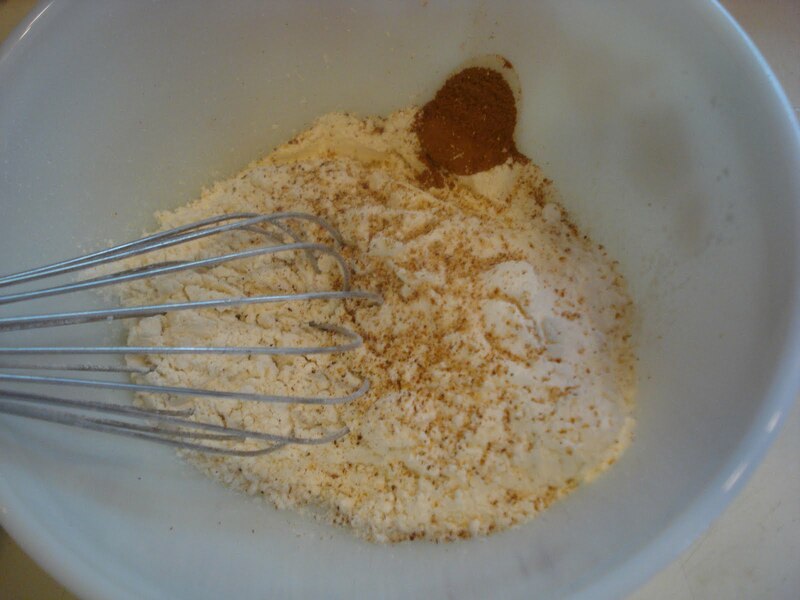 In a medium bowl, combine flour, baking powder , cinnamon, salt and nutmeg. Set aside. 2. In a large mixing bowl, beat the butter and sugars on medium speed for about 2 minutes. 3. Beat in the eggs, one at a time, beating well after each addition, then add in the vanilla. 4. 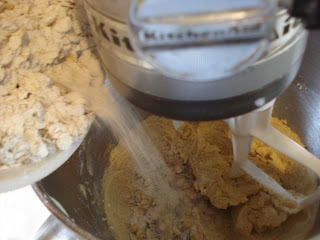 On low speed, beat in the flour mixture. 5. Stir in the add ins. 6. Scoop 1/4 cup amounts onto an ungreased baking sheet, spacing 3" apart and flatten each cookie. 8. Let the sit for a minute on the baking sheet, then transfer to a wire rack to cool. 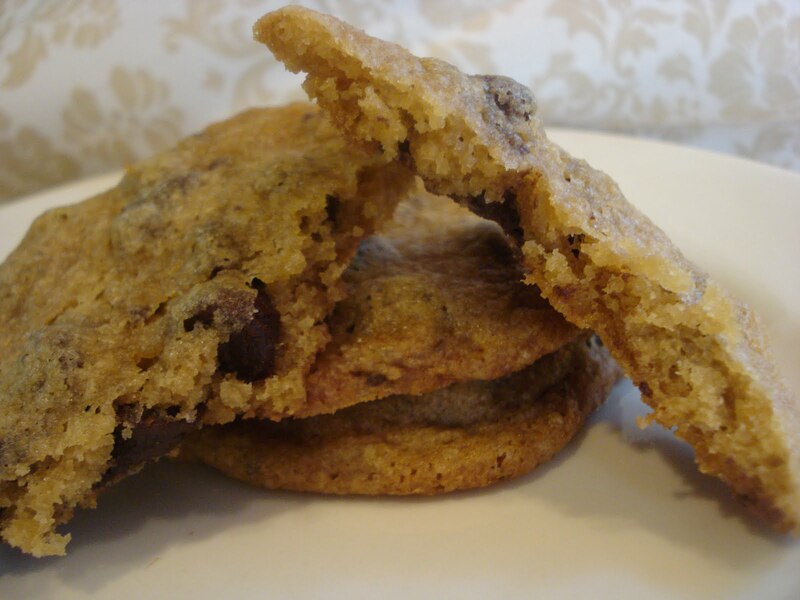 I've been aware of these thin chocolate chip cookies for quite a while and I actually remember making them over a year ago with...not such good results. But I decided to give them another chance. There are so many great reviews of them and everyone I spoke to who has tried them says they're delicious so I today I baked up a half batch. I conducted my own little experiment with them because of the results of the last time I made them. I tried my best to get exact measurements and weights, so here's what I did. First, keeping in mind that I halved the original recipe I'm giving you below, I weighed out one cup of flour ( I used King Arthur AP Flour) at 4.6 oz. ( yes I gave it an extra 0.01 ounce! 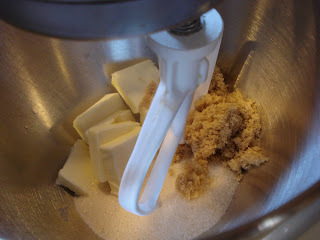 ), then I made sure I firmly packed down the dark brown sugar. I used my egg at room temperature and last, I followed the directions for making the cookies exactly. This means I mixed til just combined when the recipe said to do so. And I folded in the chips, rather than stirring with the paddle attachment. And I also was aware to not overmix the dough! I even experimented with baking a couple first, two on parchment paper and two on a greased baking sheet, with the same end results. One thing I changed was the baking time. I set the timer to 10 minutes, then checked them but they looked like they needed maybe another minute. So I let them bake another minute...then added 30 seconds and then they looked done, golden along the edges and just slightly moist in the center. So my baking time turned out to be 11 1/2 minutes but your oven may be different so I suggest experiment with a couple cookies first. This photo below shows two different batches. The one on the left is the batch I made just after making the dough. And the one on the right is baked 30 minutes after making the dough. The second batch came out thinner. Maybe because, kept out at room temp. the butter softened them more causing them to spread more? I weighed the dough for all of them so they'd all be the same size. 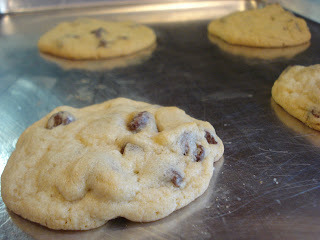 For 3" finished size cookies, I weighed the dough at 1.0 oz. So, that's my experiment for the day! I'm usually never this exact but I was determined to get it right so I can agree with the reviews on this cookie. 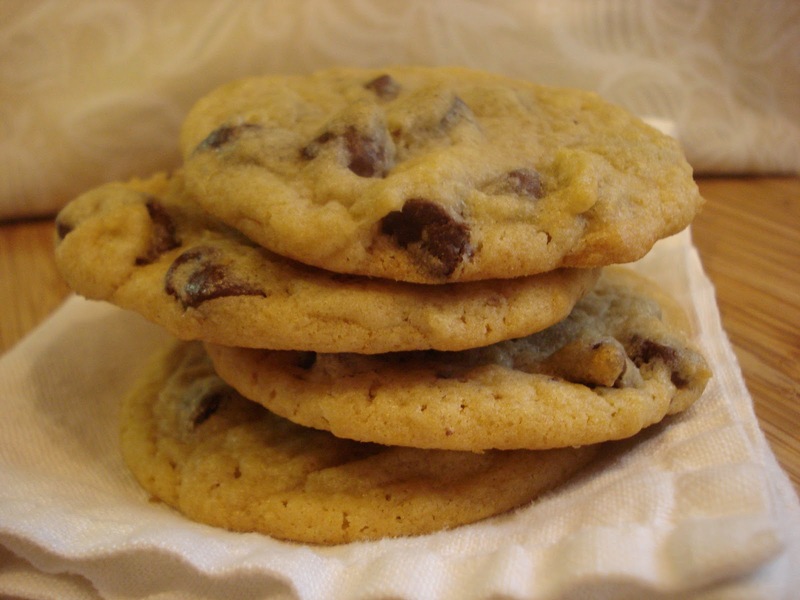 The recipe is very close to many chocolate chip cookies I've made, but just a few changes in ingredients seem to make a big difference. The dark brown sugar in these gave the cookies a wonderful deep flavor and the chip to cookie dough ratio is perfect. You get a lot of chips in every bite. 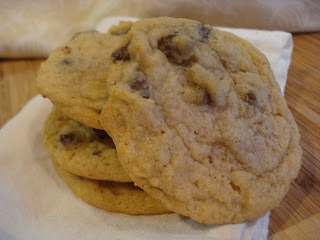 I think I found my new favorite thin chocolate chip cookie...well, maybe til another one comes along! 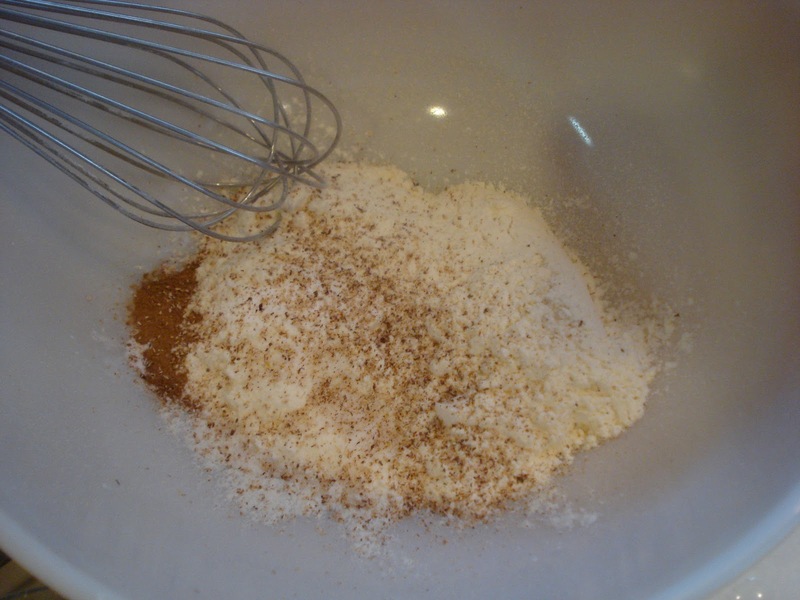 So begin with whisking the dry ingredients in a small bowl. 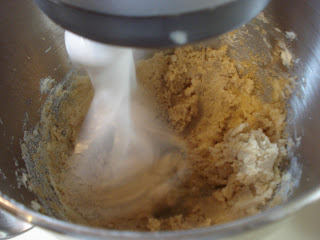 Then in a mixing bowl, cream the butter and sugars, then add the water and vanilla, mixing til just combined. Add the eggs and mix lightly. Stir in the flour mixture. Be sure to scrape the bottom and sides of the bowl. with a rubber spatula. Fold in the chips using a rubber spatula. 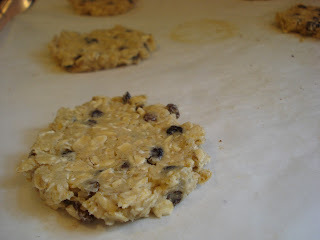 Here's where I tested using parchment paper or a greased pan. The results were the same. 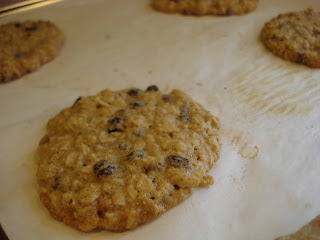 Although they didn't really stick much on the greased pan side, they did require just a little coaxing with the spatula so I would suggest using the parchment. Weighing each at 1.0 oz. resulted in a 3"finished cookie. (This is a thin chocolate chip cookie) Makes 4 1/2 dozen. Preheat oven to 350. Line baking sheet with parchment paper or grease sheet. 1. Whisk flour, baking soda and salt in a small bowl and set aside. 2. 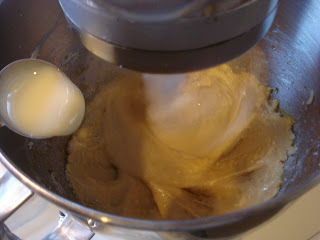 Cream butter and sugars til combined,2 to 3 minutes. 3. Add the water and vanilla and mix til just combined. 4. 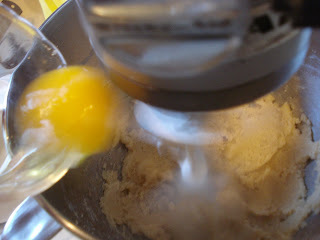 Add the eggs and mix lightly. 5. 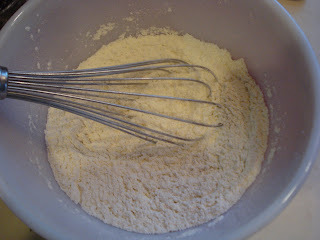 Stir in the flour mixture til just combined. 6. Fold in the chips. 7. Scoop 2 tablespoonfuls of dough onto the baking sheet, spacing 3" apart. 8. Bake 12 minutes, checking after 10 minutes, til edges are brown and centers just set.